Solar Butterflies. 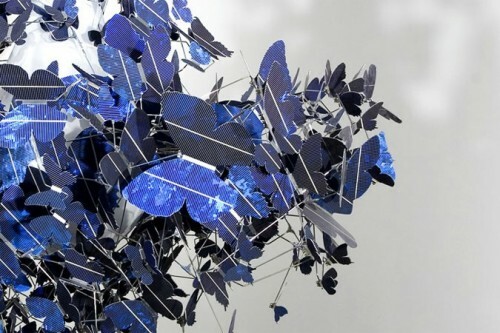 Engadget spotted Dutch designer Jeroen Verhoeven's chandelier made of 500 butterflies cut from photovoltaic cells. Called the "Virtue of Blue," the light glows softly at night. (Via Psfk.) Capitol Green. New York isn't the only city replacing asphalt with greener, more pedestrian friendly streetscapes. According to DC Mud, a block of C Street in Washington, D.C. between two federal office buildings is set for a makeover. Plans call for creating a park on what's currently a large parking lot. Killer Commutes. Slate writer Annie Lowrey tells us what we already know: commuting isn't fun. She goes on to explain the consequences of many-an-American's daily burden: "Long commutes cause obesity, neck pain, loneliness, divorce, stress, and insomnia." Nearly NeoCon. Haworth Partners announced that they have partnered with Crate & Barrel. The table and two chairs will be available beginning in July and August. More at otto. Is Your Commute Really as Bad as All That? It might not be, according to Driven Apart, a new report from CEOs for Cities. Apparently, the Urban Mobility Report-- the nation's popular source for data about commuting--is "riddled with conceptual problems, data limitations, and methodological errors that render its city-to-city congestion rankings almost meaningless." And it's also biased against more compact cities whose residents have shorter commuting distances. Additionally, the report found that the UMR has been overstating rush-hour delays and hadn't checked to make sure that certain measurements (like the impacts of fuel congestion, or relationship between travel volumes and travel speeds) were actually grounded in solid data. Luckily, the researchers of Driven Apart suggest that new numbers, specifically those focusing on trip distances and total travel times may help point "to a broader and more powerful set of public policy options for dealing with urban transportation problems." In addition, the people behind the UMR seem open to looking at new methodologies (and don't seem to be freaking out about the results of Driven Apart). 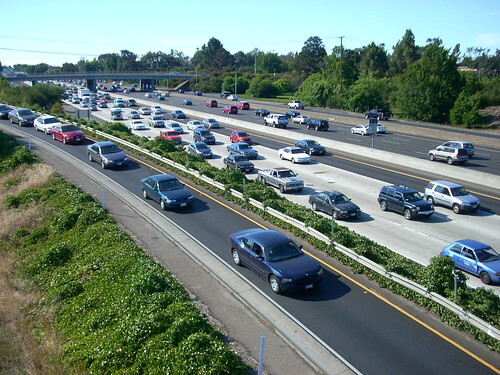 There is a silver lining to this data-driven snafu: While your commute might be as long as it feels when you're behind the wheel, it might not be nearly as congested as you've been told.